Traffic CVS Chase Election Issues! The CVS-Chase shopping center was recently approved for one of our main downtown intersections. How do you think this will affect traffic and our sense of community? Issues that concern Sebastopol Tomorrow. SEBASTOPOL, CA, July 1, 2014 – Helen Shane, for the Committee for Small Town Sebastopol announced today that it has settled its CEQA suit against CVS. Simultaneously, CVS and the city of Sebastopol have reached a tentative settlement yet to be vetted by the City Council. Shane said this will be a far better project than was applied for three years ago. 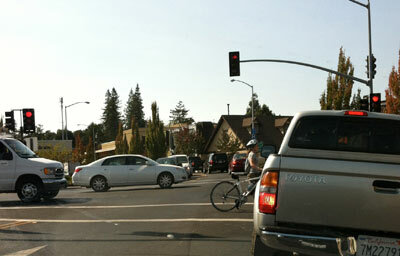 The CVS project was issued a Mitigated Negative Declaration on July 5, 2011 by the Sebastopol City Council. It would have allowed CVS to proceed with the project without an Environmental Impact Study. On August 8, 2011, the Committee for Small Town Sebastopol (STS) led by the late John Kramer and Helen Shane, filed a CEQA suit that charged that the MND was based on a flawed, inadequate traffic study. In 2012, the City levied a moratorium on new drive-throughs. Then CVS filed a suit against the City, claiming that the moratorium violated its civil rights. On the STS CEQA suit, CVS asked for and got 16 extensions on the legal prosecution of the case, which dragged on until the present. In May of this year, CVS announced that it wished to settle both the drive-through moratorium suit and the STS CEQA suit. Discussions to negotiate settlement of both cases began. City officials, Shane and Nancy Dobbs, John Kramer’s widow, attended meetings with CVS attorneys and officers. · CVS will pay the City and Small Town Sebastopol a total of $150,000 to be used for a traffic signal synchronization study and implementation of a program to mitigate traffic impacts, and to pay Small Town Sebastopol’s legal fees for the litigation. · CVS will parcelize the property into five parcels, but will occupy only one, which will be built as a two-story structure, with solar installed on all buildings. · CVS will set back its building at the corner of Sebastopol Avenue (Hwy 12) and Petaluma Ave (Hwy 116). · CVS signage will be discreet. Sebastopol Tomorrow has been, since 1984, an advocate for a human-scale, walkable, bike-able, local business-supporting, small town. We have advocated for the Plaza, the theater, the development of the Barlow for more than a dozen local businesses, and more. The CVS/Chase project at the former Pellini property has been under way for more than two years. In case you’ve been wondering about its status, here is a synopsis and update for your information. Sebastopol’s Planning Commission voted to reject the initial project design in early 2011. The Sebastopol City Council overturned that decision and issued a Mitigated Negative Declaration in July 2011. This meant that no Environmental Impact Report was required. Committee for Small Town Sebastopol filed a lawsuit in August 2011. More on that later. The plan was sent on to the Design Review Board. The Board held a number of public meetings on the plan design, made many recommendations, some of which were accepted by CVS, some crucial recommendations were not. Rather than work with the Planning Commission and Design Review Board to hammer out a development that conformed to our community’s guidelines to the satisfaction of our governing boards, CVS/Chase appealed to the Council to get their own way. Hundreds of community members attended the public meetings of the City Council, Planning Commission and Design Review Board. A heavy majority of community members voiced their opposition to allowing CVS to build at the junction of Highways 12 and 116. CVS brought to these meetings their attorneys and a court reporter in a show of power with the intention to intimidate and menace our town with threats of litigation if they didn’t get what they demanded. An overwhelming majority of our community opposed the project, but the Council voted 3-2 to approve and cited requirements formalized in the Conditions of Approval. The Council’s 2012 approval jettisoned the many hours of work done by our dedicated citizen volunteers and by the public’s comments at the myriad hearings. In November 2012, a City Council election was held. Two of the three members who originally approved the project are no longer on the Council. One declined to run again, the other was defeated in the election. The new Council late last year imposed a moratorium on drive thrus (both the CVS and Chase Bank designs have them); that moratorium can be changed to an outright ban in the late fall. CVS has filed a suit in Federal District Court claiming that the ban discriminates against them, violating their civil rights. In addition, the City in May of this year put in place an ordinance requiring solar photovoltaic energy systems on new or substantially remodeled commercial projects. CVS has been notified of the ordinance and the requirement that they must comply. CVS claims it does not have to comply with this, either. A new ordinance prohibiting Formula businesses is now being considered by the City Council, and likely would also affect CVS/Chase and a claim for immunity from them.. While CVS is currently permitted to proceed with design submissions, the City is not obliged to take action regarding acceptance or issuance of Demolition or Building permits while the moratorium is in place. A court ordered mediation of the CVS suit regarding the moratorium is scheduled for September 25, where both parties will present their case. However, this is not expected to produce a settlement, and legal proceedings in the suit will undoubtedly drag into the spring of 2014. In the event that CVS prevails in the lawsuit there are still hurdles they must surmount before final approval and the issuance of the Permits. They must come back to the Council with their revised design that incorporates the new conditions before they can start building. They must go back to DRB for lighting and signage plans/approval. They must get from CalTrans Encroachment Permits for the entrance and exits to the project site from State Highways 12 and 116, including a left turn on Hwy 12 West into the project. CVS/Chase could accept the conditions imposed by the Council, demolish the buildings, and construct the new ones. CVS/Chase could wait as long as three years. The two-year approval can be automatically extended for one year. Perhaps during this period, they would start construction. CVS would submit to DRB consideration of its signage and lighting proposal. CVS/Chase could build the project, live with it for 90 days, then return to the Council to ask that “onerous” conditions be removed. CVS/Chase could build out the project, open, and fail, due to poor design, impossible traffic, or a boycott. CVS/Chase could stay at Redwood Market Place and redesign the space to serve their declared reduced need. CVS/Chase could close in Sebastopol and leave town. Meanwhile, still to be resolved is the lawsuit brought by Committee for Small Town Sebastopol in August, 2011; extended 13 times by request of CVS, it charges that the Mitigated Negative Declaration is invalid, based on a flawed traffic impact study that did not consider impacts of The Barlow nor the traffic beyond High St. to the east and Fanning to the south on Hwy 116. If this suit is resolved in favor of Small Town Sebastopol, an Environmental Impact Review, with a new traffic impact study, would have to be done before CVS could proceed. Proceeding with this suit is projected to cost $15,000. If you feel strongly that it should be undertaken, consider making a contribution to help fund it. What about traffic to be generated by the CVS/Chase project with its TWO drive-up windows? Click here to learn more.